A Mistake by Mercedes during Sunday's thrilling US Grand Prix means that Lewis Hamilton must wait until the next race to secure a fifth world title. Delaying Hamilton's second pit stop relegated the Mercedes driver to third spot as Ferrari's Kimi Raikkonen raced on to his first victory since March 2013. Red Bull's Max Verstappen finished second, ahead of Hamilton, who now has to wait until next weekend's Mexico GP to have another crack at the title. Hamilton leads Sebastian Vettel by 70-points after this weekends race in Austin, Texas, after Vettel finished fourth. There are 75-points available over the remaining three Grand Prix, which means Hamilton needs just five points in Mexico to claim his fifth world title. During the first-lap battle with Red Bull's Daniel Ricciardo, Vettel, who started fifth on the grid, spun out. He made quick work of his fight back to fifth but it looked as if Hamilton would win the title as Vettel was too far back to score enough points to keep the race alive. As the race drew to a tense close, Raikkonen, Verstappen and Hamilton were closely bunched. With just three laps to go, the Mercedes driver couldn't nail his one opportunity to pass the Dutchman although, even if he had, it would not have been enough to clinch the title as Vettel passed the second Mercedes of Valtteri Bottas on the penultimate lap, finishing in fourth spot. Right from when the lights went out, Hamilton seemed to be on the wrong compound as Raikkonen, running softer tyres, out-accelerated the Mercedes into the first corner. Hamilton took a big lead when Raikkonen stopped, but it wasn't long before Hamilton required another set of tyres, unlike his rivals on a one-stop strategy, as his rear tyres began to blister. But Mercedes left Hamilton out for at least five more laps, causing both grip and tail-end traffic problems. Verstappen was tucked in tightly enough behind Raikkonen to pass Hamilton as he exited the pit lane. Shortly after rejoining the race, Hamilton was on the radio querying the team, wondering why they waited to bring him in and about why they fitted soft instead of super-soft tyres like Verstappen was using. Soon, the three drivers were in a close tussle but Hamilton couldn't find a way through. During a thrilling lap 54 of 56, he was side by side with Verstappen, trying to get the best advantage to get past through five consecutive corners, only to lose out by running wide at Turn 18. This season has been pock-marked by mistakes by the Vettel, so it was this miscalculated strategy by Mercedes that gave him more breathing space and another shot to make up some points. As did Bottas when he ran wide on turn 12 in the closing stages of the race as his tyres started giving him trouble. Vettel managed to be close enough to take advantage and fourth spot. Raikkonen was excellent throughout the race, defending brilliantly against Hamilton on fresher tyres. After his first pit stop, he managed to keep Hamilton within his sights and drove a tight line that gave him the lead when Hamilton pitted the second time. He kept his composure and made his tyres last the distance with a controlled and perfect drive as Verstappen and Hamilton applied pressure from behind to the chequered flag. After the race, Raikkonen said, "It has been a great weekend. The car has been good all the time. Got a good start and needed to push hard. The tyres were going off at the end but we had enough speed and kept it consistent and just tried to keep the tyres alive to the end. "It's been a long time [since I last won] but here we are." 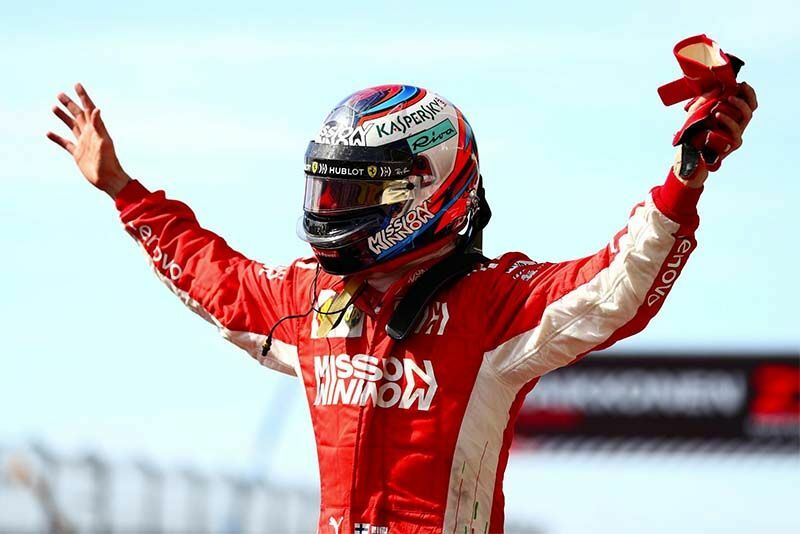 With this win, Raikkonen's top-podium tally sits at 21, which means he overtakes Mika Hakkinen with more race wins than any other Finnish driver, although he only has one world title to Hakkinen's two. Next season he moves to Sauber, so this may be the last time he can take full points as the promising Charles Leclerc takes his seat at Ferrari. Verstappen, too, had a superb race to take second after starting 18th because of problems in practice. He sliced through the back-markers and was soon running fifth before Red Bull pitted him before Bottas, this placed him third and then into second place when Hamilton stopped again. Hamilton said, after the race, "Big congratulations to Kimi, he did a great job today, no mistakes. Verstappen did a great job as well. He was on a slightly better tyre than us at the end. "I thought we would be able to do better but this was the best we could do. I'll have to see what happened with the strategy. We just have to keep working, keep pushing to the next race." There was drama after the race too as Force India's Esteban Ocon and Haas driver Kevin Magnussen were disqualified from eighth and ninth places. Ocon's car used more than the permitted maximum fuel flow of 100kg per hour on the first lap and Magnussen's more than the maximum fuel allowance of 105kg for the race. With these two disqualifications, Ocon's team-mate, Sergio Perez, was moved into eighth place behind the Renault pair of Nico Hulkenberg and Carlos Sainz. The last two point positions went to Toro Rosso's Brendon Hartley and Sauber's Marcus Ericsson. It's off to Mexico next weekend where Hamilton will look for those five points required to seal the championship although Mercedes struggled there last year. If this race was anything to go by, it's going to be an exciting battle.